To get an expert-approved step-by-step explanation, we reached out to one of Hollywood's most in-demand brow artists, Kelley Baker, who caters to the beautifully brow-blessed likes of Zendaya, Shay Mitchell, Lucy Hale, and, yes, even the Kardashians. Even more thrilling? Her breakdown only includes three steps and two tools (which in all likelihood you may already have on hand). So why not put your best brow forward this year. Keep reading to find out how to trim your eyebrows exactly like a celebrity brow artist. First things first, Baker tells us that in order to assess which brow hairs need to be trimmed in the first place, you have to begin the eyebrow-trimming process by taking a clean mascara wand or a double-ended brow too like this one and brush all your hairs in an upward motion—tails included. 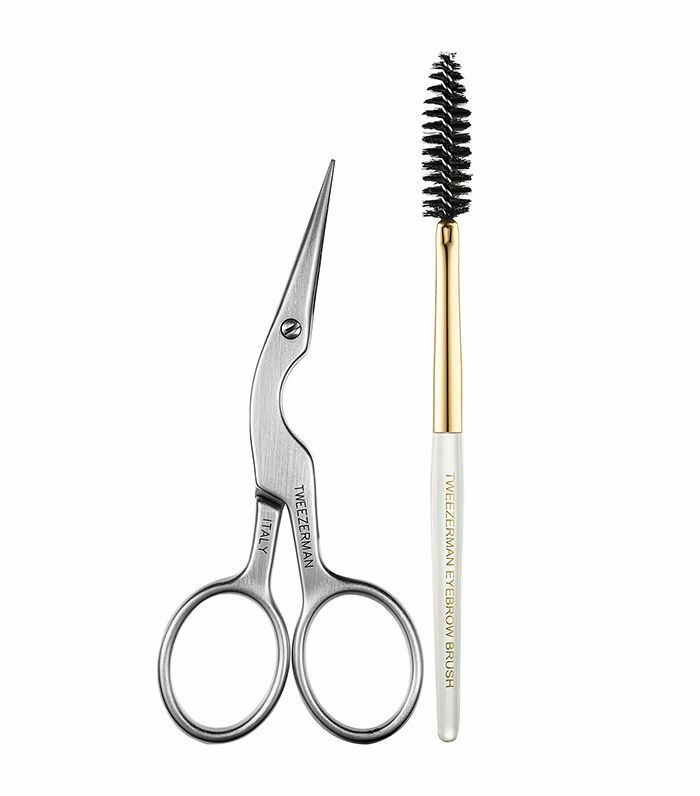 Next, Baker advises, take your brow scissors (she recommends a pair that is slightly slanted which provides a superior angle) and trim the long hairs that stick out above the top of your brow's hairline. "Make sure you take your time trimming your brow hairs and don't rush the process. If you trim the hair too short, your brows will look like they have holes in them," she warns. After your initial run-through, it's a good idea to just stop (after all, we all know how easy it is to just keep going when it comes to brow maintenance). However, if the brows still look uneven, Baker suggests continuing to brush the hairs up and trimming any strays until they all align with your natural brow shape. Pro tip: If this process still makes you nervous or you're not quite sure when or where to stop, consider making an appointment with a vetted brow artist and practicing your trim in front of them—they'll be able to tell you exactly when to put those scissors down. According to Baker, all you'll need for the trimming process is a mascara wand and a pair of angled eyebrow-trimming scissors. Simple enough, no? She prefers this exact pair from Tweezerman to achieve perfectly balanced brows. And as an added bonus, it comes with a perfectly sized brush to help you sculpt and define along the way. Need a visual? Below, we've included a video demonstrating how to trim your eyebrows from Kelley, herself! Want more brow inspiration? Watch Byrdie's editorial director get her eyebrows microbladed.